Six months after his wife dies, Benjamin (Matt Damon) quits his job at an LA newspaper and takes his two kids to live in a crumbling country house with a dilapidated zoo attached. 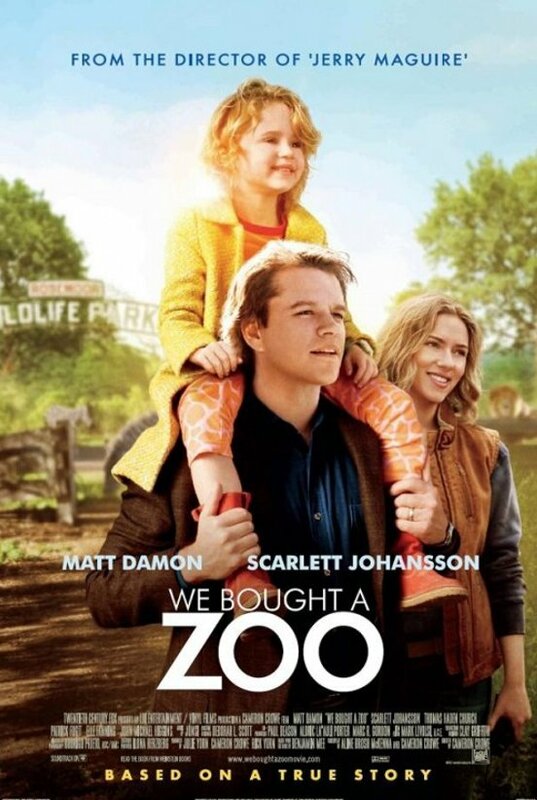 Despite his knowing little about zoos, Benjamin decides to rejuvenate and re open it with the help of the unpaid zookeeper Kelly (Scarlett Johansson). The movie is based on a true story. Directed and co-written by Cameron Crowe (Jerry Maguire, Almost Famous), with screenwriter Aline Brosh McKenna (The Devil Wears Prada), the film reflects McKenna’s sense of workplace comedy and Crowe’s emotional scope. While there are some problems: it’s blander than Crowe’s previous work, there are a few moments that are too sentimental, and the storyline between the father and his son is too easily ‘fixed’, it’s a good film. It’s authentic enough to feel for the characters and their stories; it provides a few positive existential messages, such as why ask yourself ‘why?’ Instead, ask yourself, ‘why not?’ and it reminds us that life is as an adventure worth having precisely because of its ups and downs. Ultimately, Crowe’s particular tone of voice, his talent for finding the poetry in everyday life, his ability to construct a poignant atmosphere with likeable characters, and his skill with actors (Matt Damon is good as an ‘everyman’ here, allowing a paunch and his age to show) are all evident here. This is a light, feel-good movie (Thomas Haden Church is hilarious!) with some worthwhile themes and a great soundtrack. I have always respected Miss Jelinek’s opinion, and while she has recommended it – albeit with some hesitation – as a ‘good film’, I can’t seem to bring myself to go out and purchase a tkt. I get the sense that It’ll be a fine 90 minutes of my time, but nothing more. And animals…really? Do I need to see them interacting with Jason Bourne? And I sense behind her review, and possibly from many other critics as well, that what they really want to say is that Cameron Crowe is no longer a filmmaker to be reckoned with, if he ever was in the first place. Okay that’s me saying that…me saying that C. Crowe with this film has finally been shown for the mediocre/limited filmmaker he has always been. Damon did this movie so his kids have something to watch. Scarjo did it because she has failed as a serious actress in films made by good directors – “…Pearl earring, Other Boleyn Girl…” and so she needs the work – Is she even convincing as a superhero? Hollywood puts her in the Avengers but does she even pull THAT off? And Cameron Crowe decides to go cute with animals and feel goodism. But then we are what we are…and C. Crowe has never been a filmmaker of any depth. That said, I do agree that Scarlett isn’t a good actress and I, too, wonder at her ability to continually get work – and THE AVENGERS? Me thinks its the cyber geeks of the world who have united to give this film a good rating ’cause I was bored to tears while watching it! Thank you for your reply and especially for having the guts to say that Scarlett is not a good actress. She’s not, she’s nothing more than adequate, but until the world wakes up, she’ll continue to make millions of dollars and live a blessed life…all because some d-bag executive awhile back got a hard-on for her…and then she hired a publicist and voila…she’s a star. The world is a horribly unfair place and I hate when the unworthy get a leg up on everyone else. Anyways…thanks for not mincing words.